Whether fresh or ground, cayenne is a variety of capsicum pepper common in spicy Mexican and Chinese dishes. Due to its antioxidant properties and vitamin and mineral content, cayenne a healthful addition to your diet. 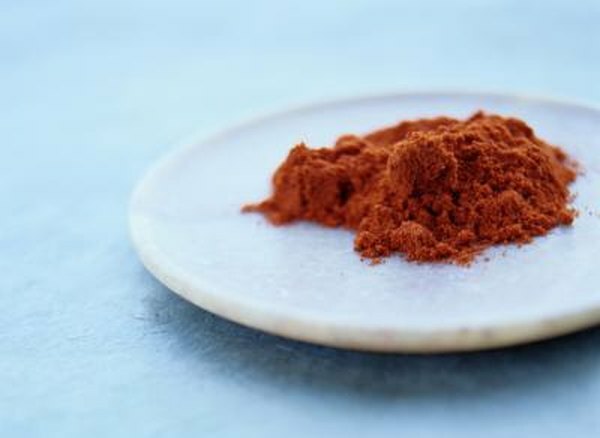 The compounds in cayenne are essential to cell division and help to improve cardiovascular health and boost your body's ability to burn fat, which means that cayenne has potential benefits for fertility. Before making any major changes to your diet, consult your doctor. Cayenne pepper contains small amounts of a number of vitamins and minerals, including approximately 10 percent of your daily intake of vitamins B6 and E and 5 percent of your vitamin C and manganese in 1 tbsp. Cayenne is rich in vitamin A, with 15.7 percent of a woman's and 12.2 percent of a man's intake in 1 tbsp. According to the University of Maryland Medical Center, vitamin A is essential to the healthy development of your baby from conception to birth. These effects arise from vitamin A's impact on cellular reproduction, which also affects the number and quality of a man's sperm cells. Perceptions of pain, heat and spiciness all arise from the stimulation of free nerve endings by certain chemicals. Capsaicin acts on these free nerve endings, leading to physiologic responses that mimic those of heat and pain. These include an increase in your pulse and a natural high due to the release of endorphins, or pain-relieving compounds. In addition to raising your pulse, the capsaicin in cayenne helps to break up and prevent the formation of blockages in your blood vessels. These cardiovascular benefits contribute to increased sexual arousal, promoting regular ovulation and ensuring adequate blood flow to a developing fetus. Aside from their contribution to its cardiovascular benefits, many of the vitamins and minerals in cayenne also serve as antioxidants. Vitamins A, E and C and manganese all help to reduce circulating levels of free radicals, which are compounds that potentially damage healthy cells. In the July 2011 online issue of "Pharmacological Research," researchers at Oregon State University note that antioxidants promote fertility in both men and women. Not only do they boost sexual arousal by helping to dilate blood vessels, but these compounds may also enhance the quality of both egg and sperm cells. According to registered nurse Beth Iovinelli, being overweight or obese limits a woman's ability to become pregnant and carry that pregnancy to term. In the September-October 2006 issue of the "Journal of Andrology," researchers at the University of Utah report that excess body weight also affects male fertility by reducing sperm count and increasing the risk of erectile dysfunction. While losing weight largely arises from burning more calories than you eat each day, many of the compounds in cayenne can contribute as part of a healthy weight loss plan. In the April 2010 issue of the "Journal of Proteome Research," researchers at South Korea's Daegu University note that capsaicin increases your body's ability to burn fat. The University of Maryland Medical Center notes that infertility is a common adverse effect of low manganese levels, possibly due to its effects on fat and carbohydrate metabolism and the regulation of blood sugar concentrations. The vitamin B6 in cayenne has similar effects, helping your body to metabolize fats, protein and carbohydrates.